On that note, let's get back to my trip to Ben & Jerry's. First, I need to mention something I forgot to in our previous post...we were graciously hosted for our visit by the small-but-mighty-team-of-two PR Department: Sean (officially known as "The Grand Poobah of Public Relations") and Liz, as well as Kevin from Cone in Boston, who also does some of their PR. This little side bar is not only a shout out and a thank you, but also an introduction so when I mention them below, you'll know who I am talking about. When we returned back to the headquarters in Burlington, we still had a packed day ahead of us. 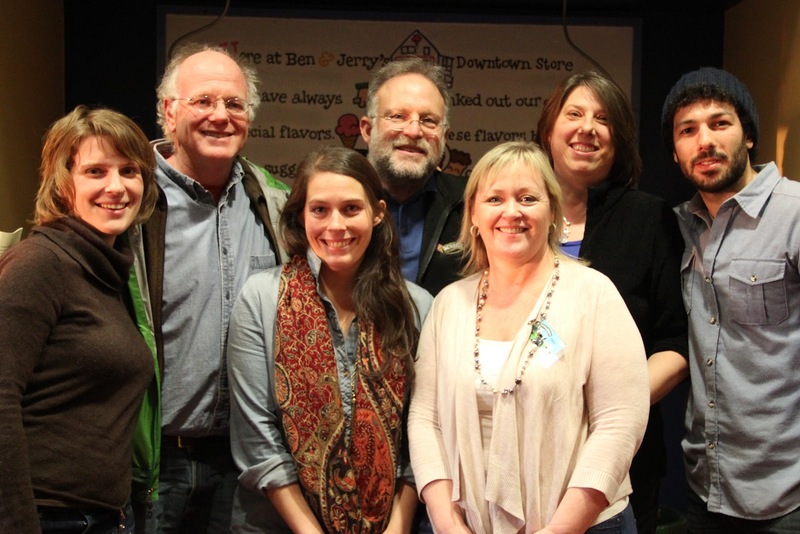 We were joined for lunch in a conference room with Jostein Solheim, the CEO of Ben & Jerry's. Though our lunch with Solheim was brief, my impression of him was a good one. Here is another member of the B&J's team who also seems to love what he does. He has a great passion for the company, its mission, its employees, the product...Solheim seemed to be a genuinely good, down-to-earth guy. He also seemed to be happy to be working for what he believes is a really great company and he gave a great example of how the culture at B&J's really does go above and beyond their social mission on paper (see below). He told a story of when Vermont flooded after Hurricane Irene. He came into work expecting to tell people that if they could help, they should be in the field helping the community recover. When he arrived, many people weren't even in. They were already doing just that. They didn't need to be told. I loved this story. Meeting with Solheim along with input from Sean (I know PR is his job, but really, I do believe he was a very honest PR guy!) made me feel better about the Ben & Jerry's acquisition by Unilever a couple of years ago. It really is the case that Unilever is the Economic arm, but the rest of B&J's (the Social and the Product) really are controlled by the smaller company of B&J's in which they really have been able to retain the values that the company was built upon. After lunch we met with the Marketing team. Having worked in a marketing department or two (one being with with Tina, as a matter of fact!) this was quite interesting to me. The team (Jody, Jay, and Mike) told us about some fun marketing promos they do. I love how they incorporate social media into their marketing with some super creative ideas, like the Scoop Truck. It's not hitting the streets quite yet, but we'll let you know when it is so you can tweet to have it come to your office. Jay also told us about how they market social causes Ben & Jerry's is behind. Currently they are supporting Get the Dough Out. 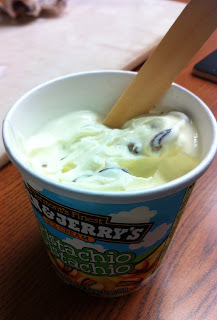 Side note, I just found out that Ben & Jerry's has a blog (which I will use to link to quite a bit in this post). Where have I been? Under a tombstone in the flavor graveyard?! I know, it kind of sounds like I'm swearing at you or something. Oh, scoop you! But really, I'm not! Read on to find more out about ScoopU! After lunch we went to ScoopU, headed by Amanda. After donning our hats and our aprons, she taught us how to make the perfect 3-oz scoop. Lindsay (who told us she was not hired by another -- unnamed -- ice cream chain years ago) was spot on with the 3-ouncer but the rest of us were a little off the first time. We all redeemed ourselves when we had to scoop into cones. All the while we got to test and test and test. As I was the only ice cream blogger, I think I tried the most, which made me seem a bit piggy, but I mean, as long as we used a new spoon each time (no double dipping!) we could try as many flavors as we wanted. Hea-ven! I found my new favorite -- Chocolate Nougat Crunch -- and tried the new Greek Frozen Yogurt flavors that were also quite good. We made some waffle cones and bowls, and I want to get a waffle cone iron and a contraption to make waffle bowls. Man, do I LOVE the waffle cone smell that makes B&J's Scoop Shops smell the way they do. When Amanda thought we had gotten good enough, she and Liz thought it would be a good idea to open up the scoop shop to the employees at headquarters. Oh. My. Goodness. I was not ready for this. But everyone was very nice and no one ordered anything too fancy. We had a broken cone mishap but our teammates Roberto and Diane resolved it seamlessly. In my first post about the trip to B&J's, I posted a video showing a really very cool method of making swirls by using pastry bags and a cake decorating stand. I learned this nifty trick in Research and Development. We met with Flavor Gurus Kristin (developer of Target's Exclusive Brownie Chew Gooder and Berry Voluntary) and John (developer of Late Night Snack and Red Velvet Cake among others -- we'd be short some reviews without his flavors!) who couldn't have been nicer and they definitely knew their stuff. When we arrived we were told we'd be making Greek frozen yogurt. 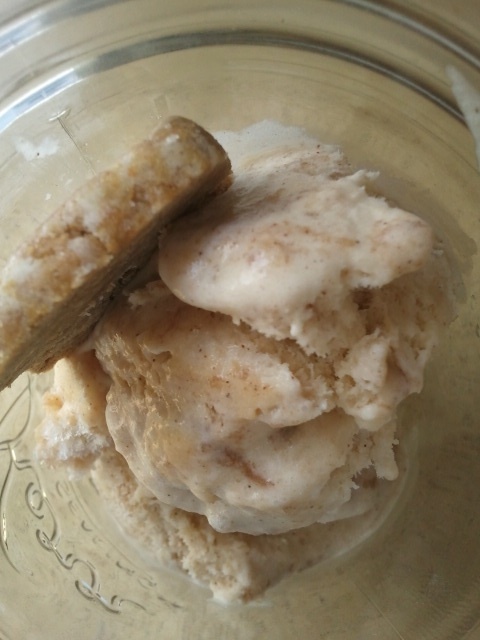 The base was already made, so it just had to be mixed with a flavor if we wanted, mixed with any add-ins put in the ice cream machine, churned out, and then swirled with a swirl. Seems easy, right? Yeah...the next two photos show only some of the options of the mix-ins and swirls -- the base flavoring didn't even make my photos! The group decided we'd try a honey base with pistachios and a swirl of fig. Way to go Greek with the Greek froyo, right? I personally think we nailed it on this one (though Jerry seemed skeptical...). So Kristin and John helped us mix in the honey to the ice cream base (I so have to work this way -- have a ton of base and just add my flavoring...) and then we added lots of pistachios. Kristin put this into the ice cream machine and churned out some very soft serve ice cream. She then put this mixture into a pastry bag, and some fig into another bag, cut off the tips of both, and then spun a cake stand that held a pint container on it. One of us squeezed in the honey pistachio ice cream and the other added a stream of the fig. We got a beautifully swirled ice cream. We tasted a bit and the rest we put into the very deep, very cold freezer so we could test it again after it had ripened a bit. We tried some other combos (plain base with nutella swirl and shortbread cookie and plain base with a lemon blueberry swirl and dried apricot -- note to self: not a fan of dried apricot in ice cream!) but neither were as killer as our first. The R&D job seemed like a ton of fun but truth be told the Flavor Gurus don't actually get to spend all that much time in the Flavor Lab. There's paper work to be done, fair trade ingredients to procure, problems to solve if the ingredients can't be found in bulk...sometimes they have to go travel for work finding new ingredients, attending events, etc., which sounds like a real drag...yeah, right! Our tour of headquarters was cut short, which might have been a bummer had it not been for the two VIPs who were hollering "Bloggers! Bloggers!" throughout the building...we turned the corner to find Ben and Jerry themselves. Like a teenager in the sixties meeting the Beatles, I got all excited and nervous and blurted out "We love you guys!" to which Jerry replied (in the true B&J's culture) "It's not us that makes the company. It's the employees." I thought it was still cool how that even though they don't spend as much time on their ice cream dream as they once did, they are still so invested in the company (I suppose I would be too if my name was plastered over millions and millions of cartons of ice cream) and how they seemed to know every employee that walked by. To me (someone who loves making AND eating ice cream) Ben & Jerry are celebrities, but that they still have such a down-to-earthness about them is pretty awesome. I only wish I looked better in the photo with my ice cream heroes since I want to show it off with pride...Just so you know, I am never washing that sweater again! Haha! Stay tuned for another post as we meet with Andrea about the Social Mission of B&J's and my wrap up of the event. Would you like to try our products and share your experience with your readers? First off we realize this is not specifically ice cream related but we are both designers who admire the MOO products and we knew we could get something for our scoopalicious blog that could inspire readers and other bloggers. We sure hope this does because the end results really excite us! And we also hope so because stay tuned for a MOO giveaway that could be yours. We'll post about that soon so be sure to check back. So MOO sends us each a credit and B and I probably each looked at the site 100 times trying to figure out what to do with it. What they offer is so cool that is was a tough decision….business cards, post cards, greeting cards, labels, stickers, etc. Okay I'll admit it…that doesn't sound cool. It's actually the customization that is pretty cool. They call it Printfinity. Hard to explain so click here to see what its all about. So what did we create?? Bethany just happened to be heading for her VIP tour to Ben and Jerry's (so jealous) so she chose to make business cards using all our great ice cream photos to hand out to whomever she met from the scoop shop employee to the new Ben and Jerry CEO (yes she had lunch with him. And yes, I am very jealous once again…seriously an amazing experience). I digress and back onto MOO. Me, I am putting together an Ice Cream themed basket for my daughter's school raffle and made some great ice cream themed greeting cards and round stickers to go with them. I was torn though..I have seen their mini cards and so wanted to get them but thought it'd be a waste since B got cards and we as a blog only hand out so many actual cards. But check out the mini cards. They are so friggin cute and definitely are conversation starters. We both anxiously awaited our packages. Mine totally surprised me at work because I forgot I had it shipped there. Love surprise packages! First off they have great and simple packaging. The designer in me really appreciates packaging. You know if they pay attention to the package and branding that the product inside has to live up. And that it did! The greeting cards and stickers were perfect and I'll admit, better than I expected. The paper and printing are premium. The paper is a thick matte finish and the color of the photos really holds up nicely. Very impressed with the quality of the image on the paper. I had such a hard time choosing what photos to use on the cards. At first I had 25 images (one per card) but then decided I would choose the images with the best color and styling. So I ended up using maybe 8 images and got about 3 cards per image. I left them blank inside so they can be used as simple notecards for any occasion. I'll also admit I am bummed to have to give most of them away :( but for a good cause. The round stickers are fun too. I made multiple versions using scoopalicious branding that can be used for different occasions throughout the year. 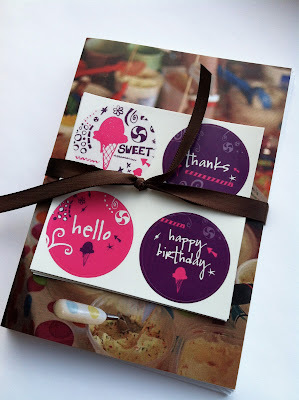 Some say Sweet, Thanks, Happy Birthday, Hi…so when we mail a card, make tags, or whatever the project we have many to choose. Again, the idea that you can choose a product and have different versions of that same purchase is awesome. In summary….Yes, there are cheaper printing options out there for these types of products but I will definitely say MOO products are a step above. And credit or no credit from MOO I'll stand by that. As designers we are always printing projects and believe me we have seen the best and worst of custom printing. You'll pay a little more at MOO but will get more than you expect. And what makes them different and why I'd choose MOO over others is the Printfinity technology that allows you to use multiple images on the same project. Every holiday I am torn between what family photo to use and with MOO you can use a different image on every card if you wanted to. So super cool! It's such a great concept for businesses/bloggers/artists with a portfolio of images they can showcase on cards or maybe the mom creating play date or holiday cards. So fun to customize the back of the card. 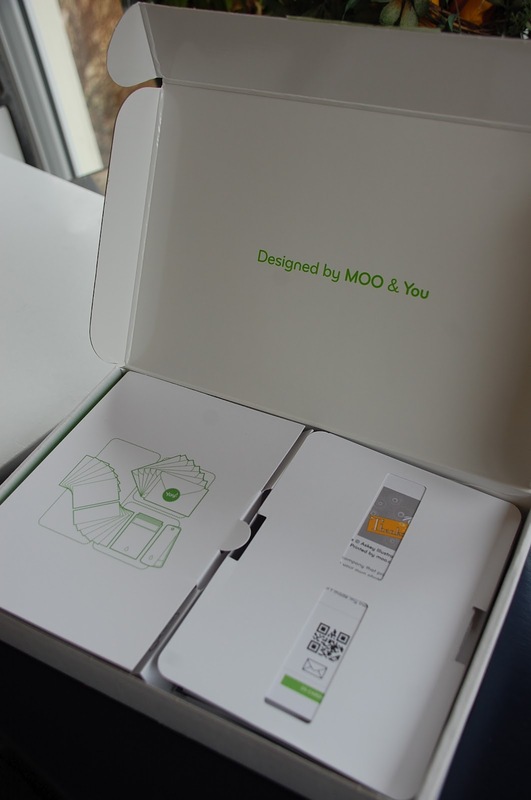 Thanks MOO for letting us try your goods and share them with our readers. Come back and visit us...MOO has so graciously offered up a giveaway and we'll be posting about it very soon!!! What a novel idea! We've done it here with Cupcake Project, that is combining ice cream and cupcakes into yummy creations (if you haven't heard about our annual Ice Cream Cupcake Contest check it out here) and now there is a storefront in the Washington DC area, YOCAKE, that dishes out froyo and cupcake combinations in one tasty cup. Plus you can add toppings like a sundae. Seriously....sounds like road trip time! Unfortunately we haven't actually been there yet but hopefully someday we will because it sounds just fun to go to. Lots of Froyo flavors both sweet and tart options and so many cupcakes to choose from. Apparently the only catastrophe is that they make beautiful cupcakes and then you cover them in froyo. I feel bad for the baker who spent all that time designing them. 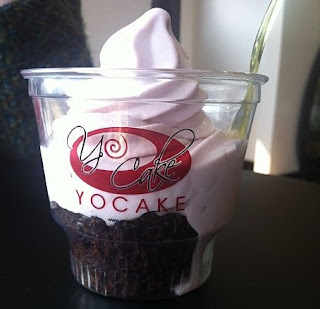 As this Washington Post article states, "In some ways, I’m surprised a shop that produces such elegant little cakes would allow you to drown them in nonfat yogurt. It’s like covering a wedding cake in a mountain of ice cream just to save the catering crew some time. But such is the price of dealing in forced gimmicks: Someone or something is always compromised, this time it’s those carefully constructed and decorated cakes produced in Ellen’s kitchen (based on recipes from her mother, a French-trained baker). I guess in the end it's the taste so who really cares right and it sounds like Ellen's mom made some good cupcakes so I bet they are awesome. If you've ever been we'd love to hear from you. In her last post, Tina worried that the Bailey's Coffee Creamer in ice cream might have issues freezing. Since the creamer is alcohol-free though, I thought it actually might be a good answer to "adult" flavored ice cream because sometimes it's hard to freeze ice cream with too much alcohol content. It froze ok (as opposed to not at all with some alcohol based ice creams) but my ice cream was kind of icy rather than super creamy. I figured I'd write about it even though I don't have time to make edits to my recipe and retry it before St. Patrick's Day, so what I'll do is share the recipe with a follow up of what I would try if I make it again. I used the fat-free Original Irish Cream (which I think may have contributed to the iciness -- it was more like "ice milk"...remember that stuff?!) but I thought I would try that since the press release we were emailed announcing it and offering us free samples said "BAILEYS® Coffee Creamers is excited to announce the launch of new fat free versions of two of their most popular flavors, The Original Irish Cream and French Vanilla." I'd never tried the "fat" versions, but what the heck...they were excited about the new fat-free ones so I'd give them a whirl. Whisk the three eggs in a bowl until pale yellow. Bring the Bailey's Coffee Creamer to a simmer on the stove. Once simmering, remove from stove and pour the hot cream into the into the whisked egg. Whisk until well mixed. Pour the entire mixture back into the sauce pan, and cook over low heat while mixing constantly until the mixture thickens. Once thickened, move the mixture from the stove, then pour through a strainer into a clean bowl. Allow the mixture to cool for a bit and add the heavy cream. Freeze in your ice cream maker according to manufacturer's directions. So here are my thoughts. If I made this again, I'd have to color it green. White for St. Patty's?! What was I thinking? I'd also try the "fat" version for a little more creaminess and less iciness. Here's what my friend and I thought. Neither of thought it tasted very much like Irish Cream. The flavor just got too diluted out with the extra ingredients and I think it was lost in the freezing -- freezing always mellows flavor. My friend thought it tasted "nutty," almost hinting at "pistachio." I kept thinking it reminded me of cake cones. You know, the flat bottomed ones they serve soft serve in? I don't know if that's the right name but that's what I found to call them when I looked them up. Anyway, I don't really find those cones have much flavor, so the ice cream was almost like a sweet cream ice cream with no particular flavor of its own. As for the iciness, my friend said "I know what you mean about it being icy but it's really not that bad." Very diplomatic friend! She's a good one! Truthfully though, I'm saving my creamer for Tina's shakes! 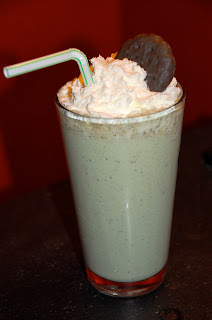 Last night, my friend and I tried making Tina's Shamrock Shake with the Fat-Free Original Irish Cream Creamer (since I didn't have Mint Chocolate Chip Ice Cream in the house we couldn't make the Muddy Leprechaun -- and yes, T, I LOVE the name!) and we loved it! Who would have thought that coffee creamers make the perfect shake! It's all about being green in 3 days. And we're celebrating a little early! Check out what we made this week in honor of St Patty's Day. Our own homemade Shamrock Shakes with a little kick, inspiration and thanks from Baileys Creamers. -Put all ingredients in a blender and blend until shake consistency. Top with whipped cream and a Girl Scout Thin Mint cookie and enjoy! Awesome minty flavoring and the Baileys Creamers makes it smooth and creamy with a kick of Irish Cream flavor that really makes this mint shake just a little more special. -Put all ingredients in a blender and blend until shake consistency. Top with whipped cream and enjoy! It was a battle of the shakes and I really do think both were great. If I had to choose I would choose the Shamrock Shake. Although we opted to keep it straight up Irish Cream (no mint flavor) that is what I liked. It was pure, simple and the creamer made it very very creamy. My daughter on the other hand couldn't get enough of the Muddy Leprechaun. And the name made her giggle! Oh and if you are feeling the luck of the Irish this week enter to win the Baileys Creamers Irish Getaway....I did and am keeping my fingers crossed! Click here for a Baileys Creamers coupon to make your own frozen drinks this St Patty's Day. Enjoy!!! There is a southern restaurant in my neighborhood called The Front Porch. Fried chicken, grits, pickled okra and banana pudding. Delicious, rightly rich banana pudding served in a small Ball jar. I'm sort of addicted to it. Ok not sort of. Completely. The other night, while gorging myself of a serving of the pudding I decided that it just had to be made into a frozen treat. I make my own vanilla wafers but go ahead and use the boxed ones. They are just as delicious. Place the vanilla bean and seeds into a medium sauce pan. Warm the milk and half and half on medium heat don't let it boil. Beat the yolks with the sugar. Add the yolk mixture to ½ a cup of the cream mixture, then whisk the egg mixture and banana mush into the remaining cream. Simmer the mixture until it thickens (to the point where it will coat the back of a spoon). Stir in the nutmeg and vanilla. Chill completely then freeze according to your ice-cream maker’s instructions. About five minutes before the ice cream is finished add the crushed wafers. Disclaimer: There was a LOT of info on this tour. I am trying to share it to the best of my memory, but my apologies to the folks at B&J's and to our readers if I have any errors. B&J's: I welcome any and all corrections! Here's the third part of my Ben & Jerry's series, in a collection of I-don't-know-how-many-I'll-need. The previous two were kind of teasers, but here we dig (er, um, is it scoop?) right into day and a half themselves. Shall I give you a tour? We started our day off bright and early at the factory in Waterbury. Now I've written about the tour before, and I hadn't given it a glowing review. I can tell you a private tour with only seven people and a tour guide is much better than a crowded tour of twenty. * I can also tell you it feels pretty special to go through the "Employees Only" door at the end of the tour. But I digress. It seriously was a better tour when I could actually see what was going on down below and our tour guide was awesome. His name was Tim and he's one of the B&J's Tour Leads. (Hope for him when you have your tour!) He was so animated and clearly loves what he does. (He is not the only one at B&J's to seemingly love what he does.) But to avoid repetition, visit my previous post for the gist of the tour. Just a freezer full of "new stuff"
displayed at the end of the tour. The tour ended in the flavor room with a taste of Mint Chocolate Chip. I don't know if I have ever had B&J's Mint Chocolate Chip and I wasn't disappointed. I did feel badly for our friend Lindsay of The Stir at Cafe Mom. Just the night before she was telling us that she hated mint ice cream. You aren't reading this post for the tour, or the flavor room, or the gift shop. You are reading this because you haven't been behing that "Employees Only" door. Well behind that door, there's a conference room that we all squeezed into to meet Laure and Nate, from Quality Assurance and Manufacturing, respectively. Laure and Nate clearly love what they do. They talked about their time at B&J's with such passion. Laure has been with B&J's for 17 years! Nate said he's one of the newer employees on the team, with 10 years (!) under his belt -- somewhere he'd never thought he'd be ten years ago, as he amusingly recounted the first time his friend introduced him to B&J's ice cream and he said "It looks like two hippies on the container. How good can it be?!" And then came this contraption (at right). Laure showed us how she checks the pints using this super cool contraption that someone in the company made specially for Quality Assurance so she doesn't have to cut the carton every time she quarters it to see the inside of a pint. Talk about tiring. Laure checks pints every hour during her shift, I believe. She looks to make sure all of our chunks are evenly distributed and that there are plenty of chunks and swirls and that nothing looks "off." We took then took pints of B&J's and compared them to pints of an undisclosed brand. 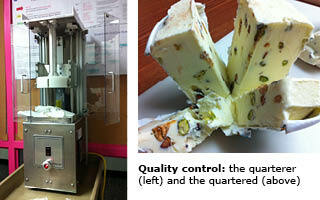 We all agreed that the B&J's looked better and tasted better. Creamier. Maybe it was because we weren't being given a private tour by the undisclosed brand, but...truth be told? I rarely ever buy the undisclosed brand, so biased I may be, but it was well before that day! They were making pistachio the day we were there, so we were each handed our own pint of "fresh off the line" Pistachio Pistachio. This fresh off the line ice cream was amazing. Perfectly soft and creamy, the flavor just melted onto your tongue (no pun intended). My heart broke when I left my half eaten carton of ice cream on the table, knowing it would be thrown out (what a waste of such amazingness) but I knew I also needed to leave room for the rest of the day. It was only 11 o'clock in the morning. There was much more to come. We ended our time at the plant with a trip to the Flavor Graveyard, and I was sad to see a couple of flavors I had never gotten to try, one of them being "Oh Pear." Oh dear. Meet me back at Scoopalicious in a couple of days for our lunch with the "new" CEO of B&J's followed by some time at ScoopU. Sometimes I act just like a kid: I get so excited for something that when it finally happens, I am a little bit disappointed. That happened on Friday. Seeing as I love to see how things are made and I love ice cream, I had hyped up the Ben and Jerry's tour so much in my head and when we finally went on it, it just wasn't as wonderful as I expected. And maybe it's because I have heard a lot of old timers say that the "old" tour used to be better. And maybe it was. And maybe they had fewer fans clamoring for tours. Things change. Adjustments have to be made. Perhaps the tour would be better if the ice cream weren't so popular. But it is. And that's good news for B&J's. Maybe not such good news for their millions of fans. One tour tip for B&J's? Two options of ice cream at the end of the tour. Then maybe our poor friend Lindsay wouldn't be so disappointed at the end!